Pair of Cyclists, originally uploaded by [Zakkaliciousness]. Cyclist on the left is making an important point [note the finger] in a conversation with cyclist on the right. 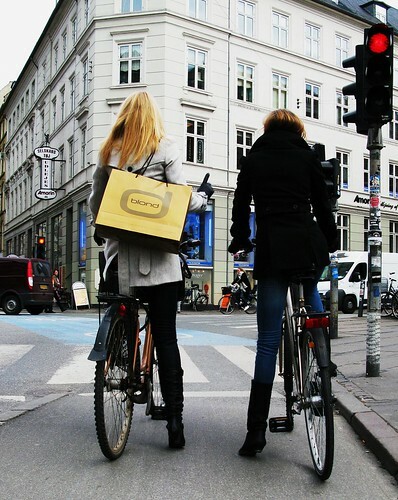 Cycling is a social affair in Copenhagen. If you're off to the cinema, on a shopping expedition, on a date, on your way home, or what have you, chances are that you'll both be on bikes. oh, thats nice! Shopalcoholics on bikes!Can you show us the content of the bags??? That's some serious tread on those tires, I wonder if she likes to get in the dirt after shopping? EK: the odds are that she bought the bike 'as is' and second-hand. it was probably the price as opposed to the tyres that helped her make up her mind. never understood treads in urban settings. useless waste of pedalling energy.